I assembled the wagon and decided the horse really needed to be hooked up a little better to the wagon (the arms of the wagon just sort of sit out next to the horse). I added a set of reigns (and tied a bridle!) 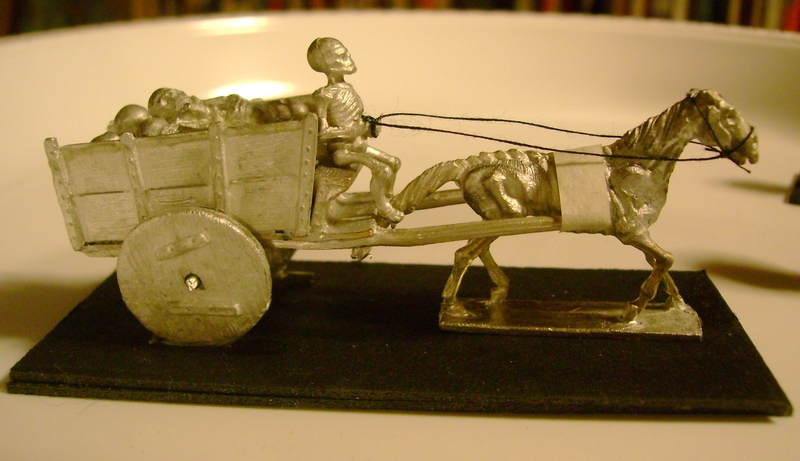 out of thread, and added strap sover the horse’s back and neck, so he might really be able to pull the wagon. Here’s a shot of the assembled wagon before painting. Naked lead — hideous! I added a strap across the horse’s chest too, after taking this pic. The detail on these guys is much more shallow than what you see on “modern” figures, but they respond pretty well to the “drybrush technique.” This probably the oldest figure painting trick, but it makes highlighting a breeze, and is also great for fur. I also use it extensively for silver and steel effects. I’ve decided these are the earthly remains of Jakko, Jonno, and Torchy Flamer, three hirelings our C&C party lost in the first expedition to the thoul-haunted basement of the inn at Eredos. Now re-animated as some necromancer’s porters and lantern bearer (no rest for the wicked, nor for the downtrodden, I guess). Jimmo, the fourth, drives the wagon. Jonno: Skeleton. HD1. HP3. AC 8. Half damage from piercing and cutting weapons. Undead. Unable to attack unless he drops his barrel; then he gets an unamed attack (d6). The barrel’s contents may be some other undead creature, such as a zombie, or a ghoul, or thoul. Or the gaseous from of an injured vampire, if encountered without a necromancer. Or treasure. Jakko: Skeleton. HD1. HP5. AC 8. Half damage from piercing and cutting weapons. Undead. Unable to attack unless he drops his basket; then he gets an unamed attack (d6). 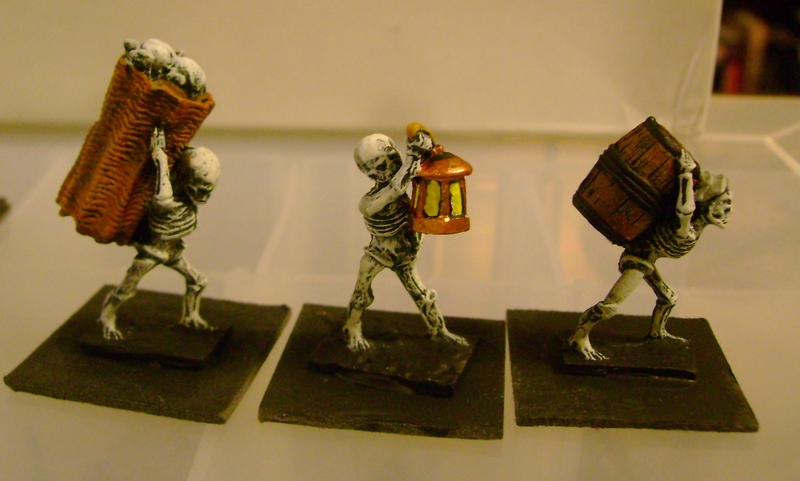 d6 skeletons will assemble themselves from the contents of the basket. 2 full rounds after being dropped, one skeleton will emerge from the basket per round until all of the rolled number appear. Torchy Flamer: Skeleton. HD1. HP2. AC 8. Half damage from piercing and cutting weapons. Undead. Attacks by bludgeoning with his lantern (d6); 505 chance it breaks on any hit, leaking flaming oil on the target (50%) Torchy (25%) or both (25%) as per a splash of flaming oil. The leaking lantern will explode after one round (as per a direct hit by flaming oil on both Torchy and whoever he is fighting). His lantern, if recovered intact, holds double the normal amount of oil for a lantern and so burns twice as long as normal. It is made of brass and worth 5 gp. 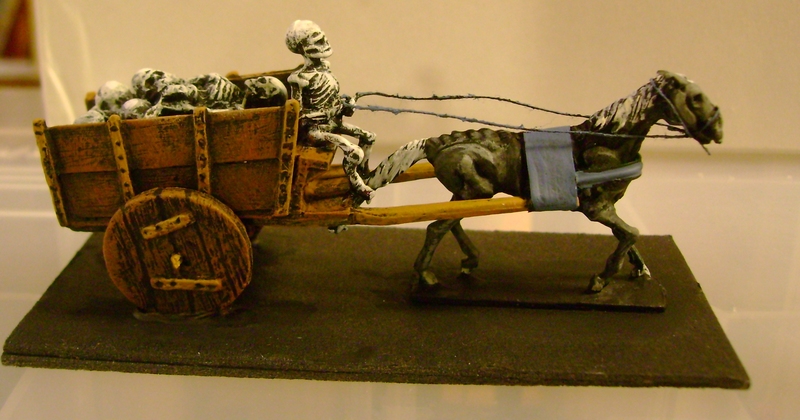 The wagon: The wagon is pulled by an undead horse, Mangey (treat as a zombie but with 12″ move) and driven by a normal skeleton, Jimmo, with a ring that allows his controller to order him and any undead on or near the wagon. 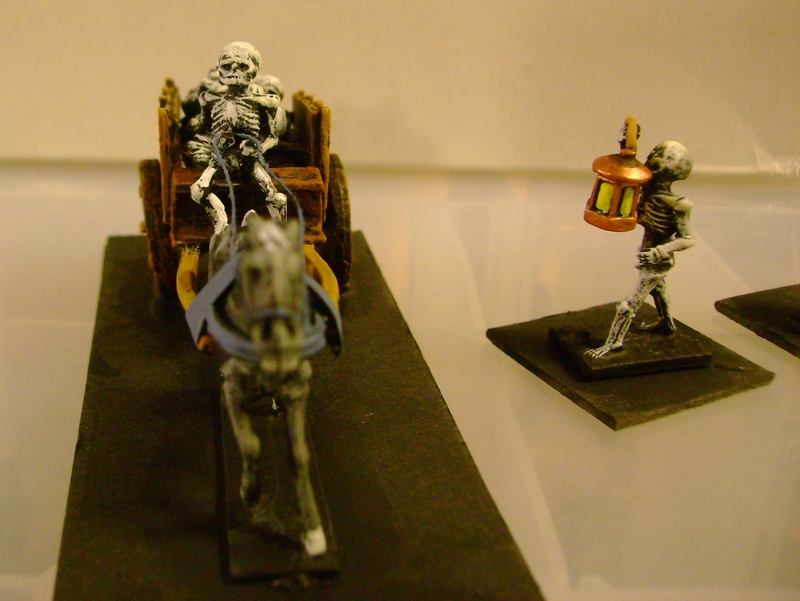 The bones on the wagon, much like the ones in the basket, are already partly animated and will assemble themselves so that one complete skeleton will emerge from the wagon per round for 2d6 rounds, beginning on the second round of combat. The wagon itself is enchanted to do this; a Dispel Magic or Remove Curse spell will disable this effect. 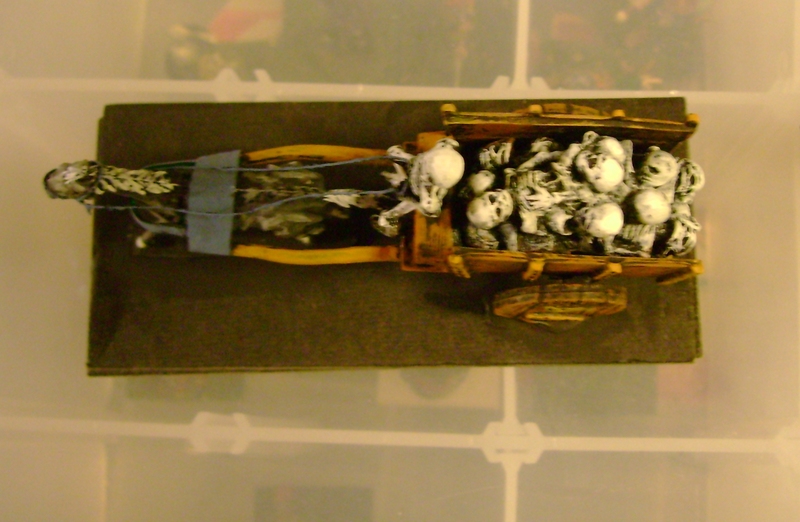 Otherwise any bones or dead bodies placed on the wagon will be animated after 2 full turns on the wagon, but they will not do anything but await the command of the necromancer (or vampire, etc.) who created the wagon. The ring worn by Jimmo is useful only to it’s creator, but otherwise worth 15 gp. The creator of the ring will be able to scry through it unless Dispel Magic is cast on the ring. If Turned, the entire party will attempt to flee to the nearest graveyard. If left on their way, they will travel at 6″. The driver hops down to add any bones they find along the way to the cart. Ha! Love the idea of skeleton recruiting party. Between Greyhawk and Valley of the Four Winds, Minifigs definitely had it going on in the early 80’s. I invested in a small army of Swampmen, myself, which I proceeded to paint in garish, Hieronymus Bosch shades of cyan, pink and gold. Neat stuff. I wish more was being recast.